The Lost Trail Station, located 15 miles north of Creede, is significant not only for its transportation history, but also for agriculture, and architecture. Buildings on the Lost Trail Ranch. The property originally operated as a stage stop from 1877 to around 1895. Around the time the stage stop closed, it shifted to cattle ranching activities. While cowboys initially used the buildings when in the region, the property became a working ranch in 1921. The log architecture extant on the property serves as an excellent example of early vernacular craftsmanship in Colorado. The peak transportation years through Stony Pass were 1875-1882, and as more commerce shifted to the railroad, former stops along the Stony Pass Road struggled to reinvent themselves. The railroad presence affected the lives of the residents in the San Juan region, and the evolution of the Lost Trail Station demonstrates how the railroad had such a diverse impact for Stony Pass and the settlers living near it. 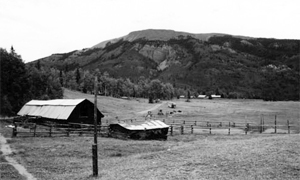 After the station was finally abandoned around 1895, ranchers saw the value in the high mountain pasture and led their livestock to graze seasonally. From 1895 to the present, Lost Trail has operated as a ranch and cow camp. This property typifies the evolution of properties and businesses in the region during the 1890s due to changes in methods and routes of transportation in the late nineteenth century.